The superficial squamous cell comprises the outermost layer of the non-keratinizing epithelium. The 1,604 µm eosinophillic polygonal shaped cell houses a 25 µm centrally placed pyknotic nucleus. No nuclear detail can be seen due to nuclear degeneration. Superficial squamous cells are seen in abundance during the late proliferative and ovulatory phases of the menstrual cycle. At these points, estrogen is at its peak. 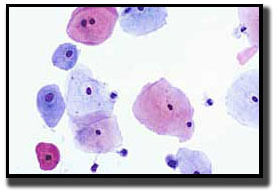 The polygonal-shaped intermediate squamous cell size ranges 1,256-1,618 µm. The cell is found in the stratum spongiosum (midzone) layer of the squamous epithelium. 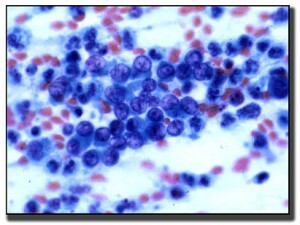 The intermediate cell’s cytoplasm is thin, transparent, and typically stains basophilic. The centrally placed nucleus is 35 µm. The nucleus is vesicular with fine evenly dispersed granular chromatin. Intermediate squames are seen in abundance when progesterone is at high levels. This occurs during the luteal and early follicular phases of the menstrual cycle, and the second and third trimester of pregnancy. 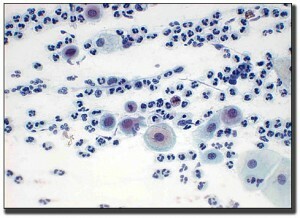 Squamous metaplastic cells are round to polygonal in shape with dense biphasic staining cytoplasm and round centrally located nuclei. They arise from the basal layer of glandular epithelium as a protective response to stimuli, creating the transformation zone. These metabolically active cells are often the site where abnormalities occur. Throughout a woman’s lifetime, the transformation zone regresses from the ectocervix and up into the endocervical canal. Parabasal squamous cells are found in the basal layer of the squamous epithelium. The round- to oval-shaped cell is 318-706 µm in size. The dense homogenous basophilic cytoplasm encloses a 50 µm nucleus. The nuclear detail reveals a finely granular chromatin. Parabasals are an uncommon finding on Pap smears of women with estrogen production or replacement hormone. These cells are often seen in patients who lack estrogen, including those who are premenstrual, post partum, taking estrogen-restricting hormones, or postmenopausal. 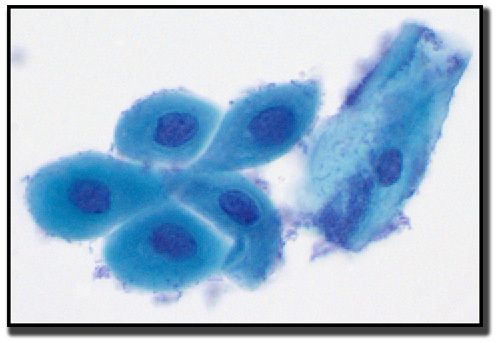 The tall, columnar-shaped endocervical cell is 188 µm in size. The mucinous cytoplasm of endocervical cells are visualized as being granular or vacuolated. The 50 µm round basally placed nucleus reveals a fine granular chromatin with an occasional nucleoli. 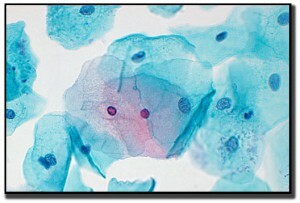 Endocervical cells can be seen on Pap tests in three arrangements: single cells, as strips, or as a sheet. 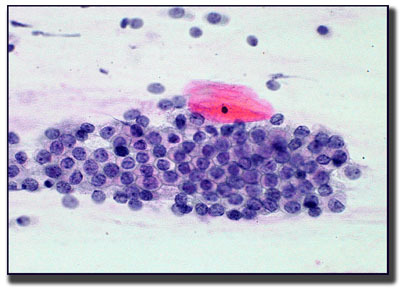 Endometrial cells are small and cuboidal, averaging 10-20 µm. The nuclei are hyperchromatic and may be round- to oval- to bean-shaped. In cycling women, endometrial cells are expected to be seen on Pap tests from the first day bleeding starts through the twelfth day. After day twelve, the presence of endometrial cells may be considered a significant finding. However, the patient’s age and any exogenous hormones being taken play a role in these “out-of-phase” endometrial cells.